ANDERSONVILLE — A new vintage store located off Andersonville's main commercial strip aims to offer high-end vintage pieces at lower prices than competitors — thanks in part to all the loot the owners said they saved renting a thriftier location. 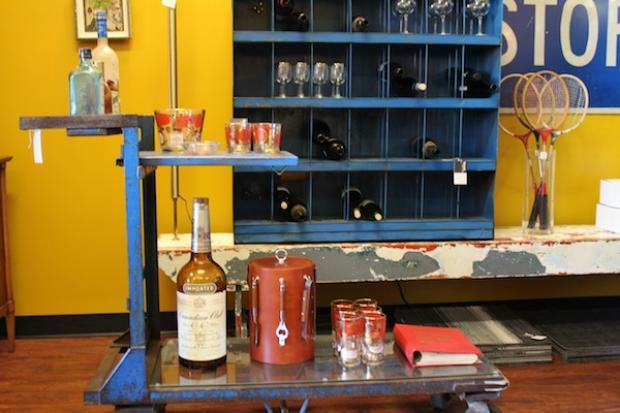 Store owners and vintage aficionados Brian Mattes and Kevin Schultz opened Found Vintage Living last month at 1551 West Bryn Mawr Ave., just west of North Clark Street. The store sells vintage furniture, barware, art and other home accessories. Most of the store's furniture pieces fall between $400 and $800, although a desk there can sell for $90. Accessories cost anywhere between $10 and $100. Mattes told DNAinfo.com Chicago that while the North Side neighborhood is home to numerous vintage shops, "the one thing that was missing was something that was affordable." "I love all the stores up here and I think everybody has a nice aesthetic going on and they all have a warm atmosphere," said Mattes. "But a lot of the stores are very expensive. So what I wanted to bring to the table was cool vintage pieces, not worry so much about the name brand on them and keep them affordable." He said they "were able to do that by taking a walk [west] up Clark," to 1551 W. Bryn Mawr. He said the owners saved about 25 percent of the cost of renting on Byrn Mawr as opposed to other locations they considered on the main commercial strip — and that they are passing the savings to customers. For example, Mattes said, his shop is selling a European-style credenza for $1,295, which is still a big sum for a lot of people, but reasonable in his opinion because the same or similar item might cost somebody at least $2,000 at other local stores. Mattes and Schultz were initially considering launching a wholesale operation that would sell pieces to other stores, "then as we were collecting pieces, we thought: we really have this love for vintage," Mattes said. Mattes and Schultz said in a release that their store "will be a haven for authentic home décor from the 50s, 60s and 70s, along with some unique industrial pieces." “I have always enjoyed the hunt — finding great vintage furniture and housewares that have a fit and function in today’s lifestyles,” Schultz said.